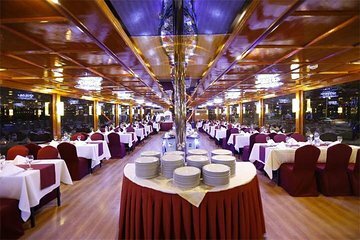 Take a break from the hustle and bustle of Dubai and take a relaxing dinner cruise on a traditional dhow boat that includes hotel transfers. Sail along the Palm Lagoon area and see the city skyline twinkle as you enjoy a delicious buffet dinner accompanied by a selection of non-alcoholic drinks. Watch a whirling dervish Tanoura dance and puppet show while you dine to complete your dhow experience.